Very interested in this for 3.8, when will it be available? I have a client that needs it soon! Hi, I’m very interested in this plugin but I’d like to see a demo if possible prior to purchasing it. Possible? I am very interested in this plugin for a store I am about to launch, but has recently told me they now want to offer wholesale pricing as well. Lucky to find your plugin… any thoughts? Hey Rob, Wholesale Pricing will fit your needs perfectly, create a custom User Role by following the Plugin instructions then set your pricing levels and you’re set to go, in the future you’ll be able to assign custom pricing levels against each User instead of each User Role which I’m very much looking forward to supporting! Yep, I’m interested in your Wholesale plugin for WP 3.8.1. when do you think it will be avail. looks like a great plugin. I am very interested in the release of the 3.8 compatible version of the wholesale plugin. Please let me know what the estimated release date will be. I haven’t heard from you in a long while. I hope everything is okay. This plug in looks very interesting, but I was wondering if you thought it will include some specific functionality, or if you know of something that does this. I have a Franchise company that wants to sell retail products and also have members (franchisees) be able to log in and add bulk products (some not available to the public) to their cart and check out without paying. Essentially, their account and order would transfer to the franchise as a PO to be fulfilled and billed later. So, I’m looking for member’s only pricing that don’t have prices and a way to skip the standard checkout process and email the order. They’d like to keep the order history for each member also so the franchise and the franchisee can see their orders online. Make sense? Hi Michael, I’m hoping you might have some insight into your plugin and if it will do some of what I’ve described above. If it will, then I’ll be moving forward with it. Does anyone know of a quantity based discount option for wp-ecommerce? I too need a 3.8 version, will this work? Do you have a vague ETA for the 3.8 compatibility? I am building a new store on 3.8 at the moment and want to hopefully go live in the beginning of May. Do you think you will have something ready in the next week or two? Thanks for your great plugins! Going to get printable invoices soon. Any eta for the 3.8 version of the plugin? I’m also trying to set up a wholesale site, which I am placing behind a login on my page (so only approved re-sellers can get in to order cases/enjoy wholesale pricing). I’ve set up this control with the “Member Access” plugin, and it seems to work great. However, my customers need to input their details into this registration form, and then re-enter all their details into wp-ecommerce’s order forms. Is there some way to connect wp-ecommerce’s forms to the user account data that’s already available, to properly link wp-ecommerce’s representation of a customer to the list of users my site already has? I’d also like to have the shopping cart empty when the user logs out (it’s very strange to log in and see the previous user’s cart if you are using the same computer). I’m looking forward to all the features you’ll have in the wholesale plugin when you’ve gotten through the big shopping list above! I’d love to have more built in features like those so that I can run one online store instead of two ! Would be great to find out. All of the above likely will change later in the year when we add more product. Right now, we only have 1 product out, sold as a download but all customers also receive a CD in the mail. Wholesale customers buy the same product, but only the CD. I am familiar with the UAM (User Access Manager) and have used it on several sites. Will your plugin work with that plugin? 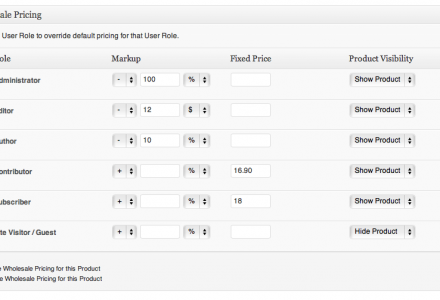 Hi sonogreen, Wholesale Pricing currently uses User Role-based checking, I could easily add a unique capability to WordPress which will then be supported by UAM. I’ll look at this tomorrow morning. For that particular website I do not care if it is UAM or any other plugin that allows me to create roles for users beyond the roles WP offers. What is the most important for me is the tax handling. My wholesale users might be charged sales tax but usually they are sales tax exempt here (when I have the company tax ID on file I can sell them product for resale without adding sales tax). All retail customers pay sales tax depending on the state they are in. This I need resolved quickly. Can you help? In the future as we have more products, wholesalers might order only 1 product of a certain kind and more of another one and I would like to be prepared and not start looking around for solutions again in a couple of months. I.e. Wholesale pricing will be necessary for approved customers for all order quantities. I know, right now, I could resolve the issue with quantity discounts, but I want to be prepared. As long as I can create also “wholesale pricing quantity discounts” I can just enter the retail value for qty 1-3 and the discounted price from qty 4 and up. But the scenario as described above is what I need to have fixed right now. 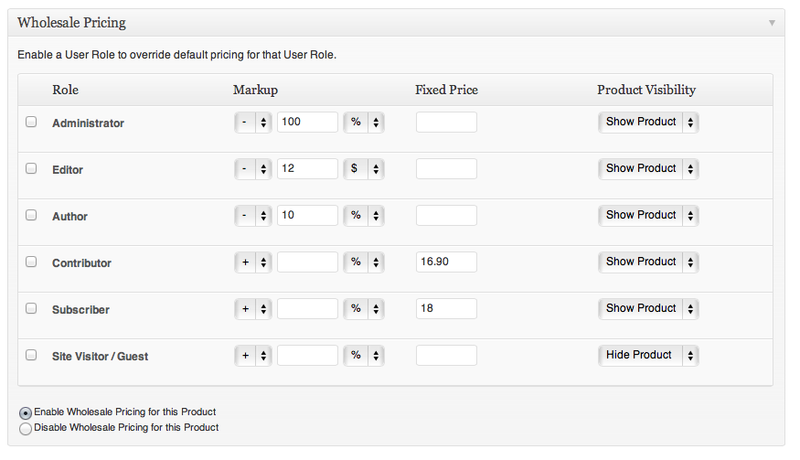 Is the current version able to do per product price change or just across the board. Also if not when will the version that can be released. Thanks! 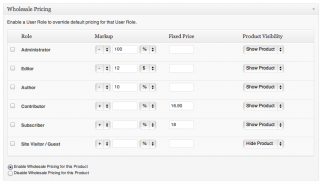 Hi allofthepeople, as above currently the price change is across the board per-User Role, I have a high-priority Job to complete which once complete I can focus on releasing per-Product price change support within WP e-Commerce. The Plugin update will be available as soon as it’s stable, not a moment later. I have a client who requires per-product wholesale price functionality. I’ll purchase when it’s available. I’m also interested about the per-product pricing sale plug-in or whatever you’re going to call it :). I want to know if this plug-in will be a free update for this one, or will it be a stand alone plug-in. I also bought from you the whislist plug-in and both me and my customer where satisfied. My client wants to be able to set prices on products, not per role, but per user. Is it something your plugin might do?